Going forward, I will put the date of the last update in this section. That way, if you visit the site, you will know when something has changed. The main point of this website, in general, is to share some of my opinions related to "tech". 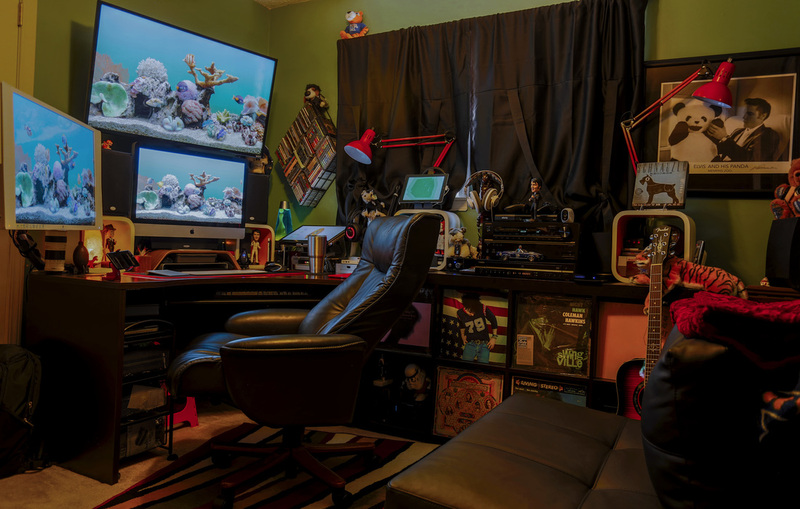 This page has my "home office", which is where a lot of my current tech resides, so it should give you a pretty good idea of my perspective when reading my blog. 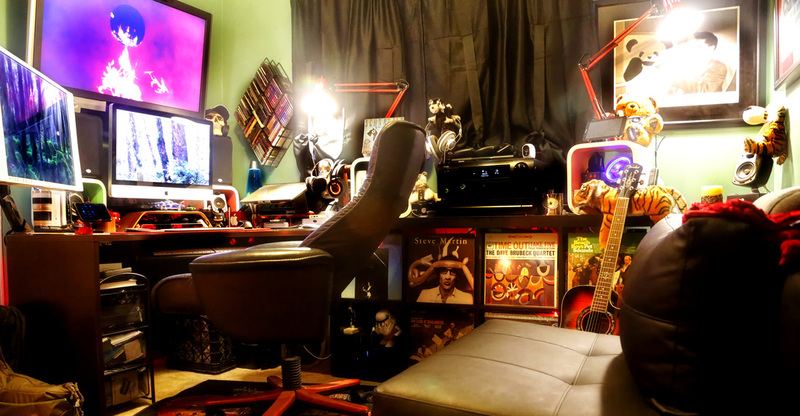 Hopefully, it will also provide some inspiration to others that are designing their offices around their hobbies. As I have mentioned before, my office isn't meant to be perfect for you. However, if you are getting started or starting over, maybe it will still give you some ideas. October 2016 update: I decided to update my office video since I recently updated the TV, receiver, etc. Also, I am testing a new video editing program called Pinnacle Ultimate 20, so there is some weird 4:3 video quality at the end of the file (not sure what caused it, though). Anyway, I hope you enjoy the updates. If you have any questions, please let me know. NOTE: I moved the older videos to the bottom of the page if you still want to see any of them. I may just make that the landing place for all older setup videos since I will continue to update with new videos as things change. However, at this point, the only thing on the horizon is a new MacBook Pro. My most used display is a 32 inch HP Studio Spectre Ultra HD Display. My review is available here. I decided to put it on the Ergotron arm mount that I was using for the Asus I had in the setup at one time and it works great. Since it is so large, I like to have the ability to swing it out of the way or move it up or down depending on what I am working on. It doesn't have a VGA or DVI input like my old ASUS, but everything I own can use the HDMI or display port inputs, so it isn't a problem. The main upside to the monitor is the fantastic 4k display. The 27 inch iMac (2560x1440) obviously has a display built in. However, the display can also be used as a display for my 2011 MBP or my 2016 MBP via thunderbolt. It is very versatile and gives me the option to use it with its own computer or use it with my laptop. As I mentioned before, I was waiting for 4k displays to drop to the $500 price point before updating the TV above the iMac and that finally happened. I found a Vizio 43 inch 4k TV (E43U-D2) for less than $380, so I went ahead and updated my old TV. The Vizio isn't the greatest 4k monitor on the planet, but for my purposes, I mainly wanted the extra resolution for seeing my own photos on a larger high resolution display and for connecting to my Onkyo receiver that can feed it 4k signals from several different sources thanks to the fact that it receives a signal from my main setup in the living room. What Computing Hardware do you have? New: In February 2016, I was given the opportunity to review the Toshiba Satellite Fusion 15. It is actually a Windows 10 "convertible" computer that can be switched from laptop to tablet by folding the keyboard back. It may not fit into the title of "Mac Attack" on this page, but it is too late to change the name at this point. It has a 4k HDMI output, so I currently have it my desktop setup. It will probably be my travel computer as well since I like some of the viewing modes that make it easy to use for watching videos. Now that we have more of a convergence of apps available on both OSX and Windows, it isn't as much of a sacrifice. I can run Lightroom and Photoshop on both setups, which is about the only thing I use a laptop for when I am out of town. 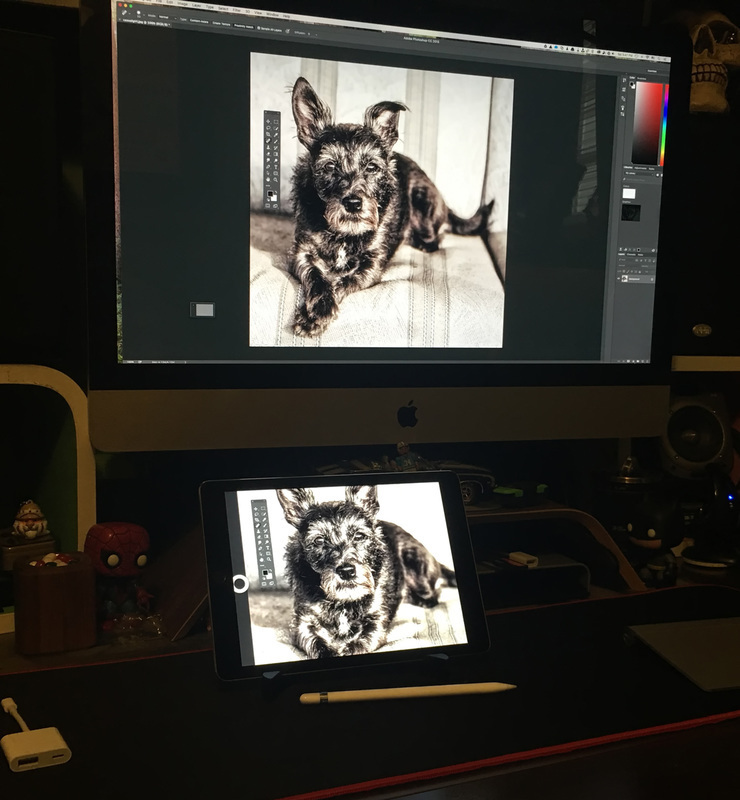 The only downside is that Astropad only runs on the Mac (see more on that in the iPad Pro section). Yep, your favorite apple fanboy has just added a Dell Gaming PC to the stable. I now have 3 Windows PCs, not to mention having Windows installed on most of my Macs, so it is hard to say that I am an Apple only fanatic. I should mention that I got both of the PCs for review purposes, so I guess you could say that I was willing to find a place for them both in my computer stable. The space in my office is at a premium and I am always adding, so it should be said that I was willing to re-cable my setup, find a free port on my monitors and clear out space under my desk for the PC. I am happy with it and it was worth the time and effort for just being able to play Tekken 7. I do plan to put some of my own $$ into it, though. It will run better with an SSD and a 16GB RAM, so I will be putting those in it soon. 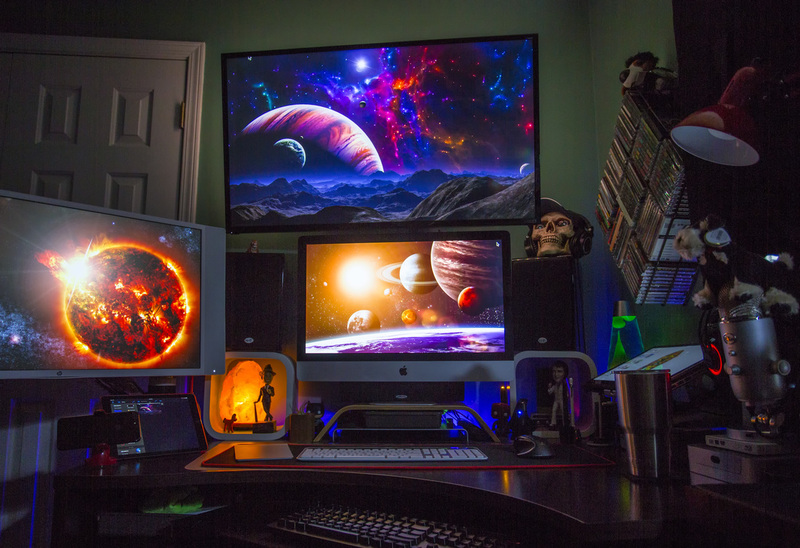 I still prefer Macs for most of my home hobby usage, but I do like playing the occasional computer game and that is an area that Windows excels. I thought the Dell i5675-A933BLU-PUS Inspiron 5675 AMD Desktop, Ryzen 5 1400 Processor, 8GB, 1TB, AMD Radeon RX 570 4GB GDDR5 Graphics, Recon Blue was a good value at its retail price of $850, but they are currently selling it (10/30/17) for $699, so it really starts to make sense as an entry level Gaming VR Ready PC at this point. I have given my initial impressions here. 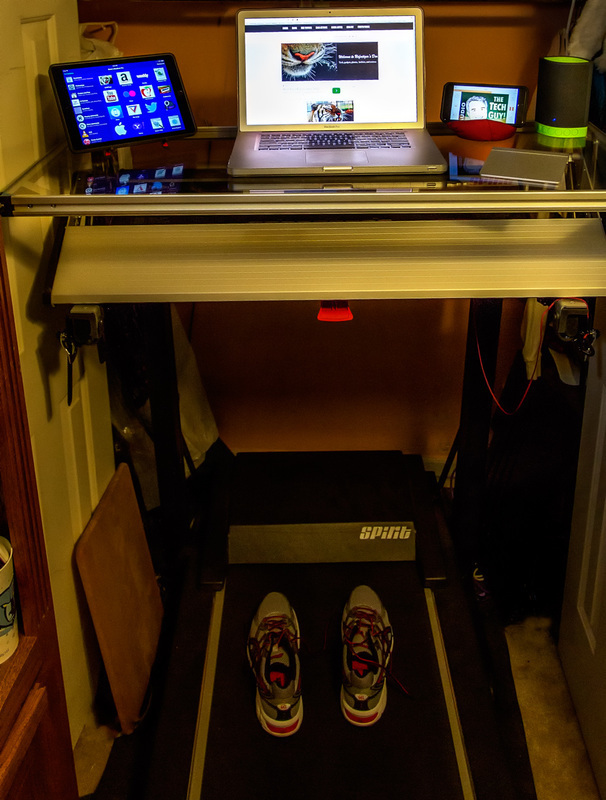 Below is a pic of it on my Tripp Light standing desk, that I reviewed here. 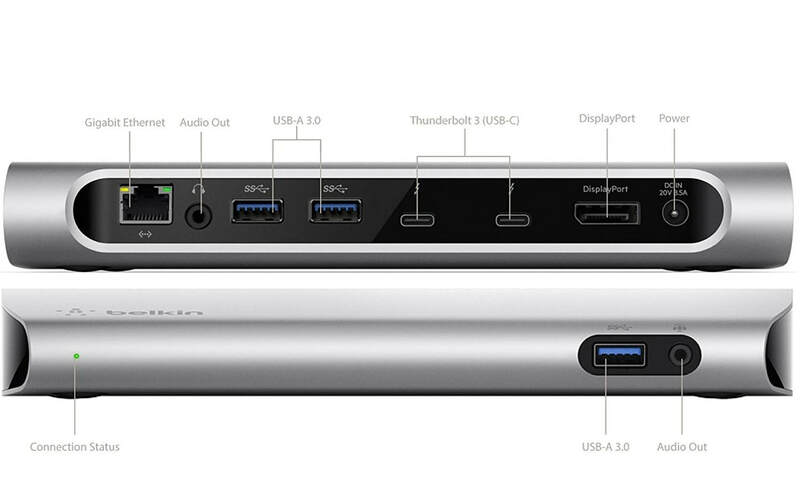 One thing I like about the thunderbolt 3 inputs is that they are backward compatible with my Elgato Thunderbolt 2 dock (my review) This means I can plug in one cable and be able to use it with my iMac's display, feed a signal to my Onkyo Receiver and put a 4k signal up on my Vizio, and also have it connected to multiple SSDs, my DASkeyboard and mouse. I have also added a thunderbolt 3 dock that sends a 4k@60Hz signal to my HP via the DisplayPort, powers the MBP, and gives it access to a few more USB 3 drives. It has ethernet, as well, but I haven't connected it yet. In other words, I plug in 2 cables and have access to everything I would ever want to use in the space. Right now, I am not using the other thunderbolt port, but I can daisy chain the Elgato if I don't need to use the iMac as a display (which doesn't work with Target Display when daisy chained). Of course, I still have some older Macs! 2010 & 2011 were the years that I decide to get on board with OSX. I tried it out back in 2010 on a Mac Mini and I liked it, so I bought more Macs in 2011. 2011, 27 inch iMac - It boots from an SSD drive that is mounted on a Seagate Thunderbolt Adapter. It is the easiest upgrade and I recently decided to change out the 256GB drive to a 960GB Crucial drive. It was as easy as backing up using CarbonCopy Cloner and restarting to the new drive. Below is a pic of the Seagate Thunderbolt adapter. I have three of them that are daisy chained to the iMac. I keep them on a shelf under my desk, so the adapters are out of site. Since they are connected via thunderbolt, I can also use them as a source for my MBP via a thunderbolt dock. 2011, 15 inch, Anti-glare MBP - I removed the optical drive and replaced it with an SSD. Since it took the place of the CD drive, I still have 750GB of onboard memory in addition to the 256GB SSD drive I installed. I had a video graphics issue in 2015 and Apple replaced the internals for free, so it was almost like having a new computer. The 2016 MBP has taken its place, so I connected to the TV in my office, but I don't use it as often as I used to. I was hoping to have it run in clamshell mode and wake up when I wanted to use it, but I could not get it to operate in clamshell mode (maybe that is an issue with antiglare MBPs? ), so it is less useful in that setup than I had planned. 2010 - Mac Mini - It still feeds two setups video and it serves media all over the house and even away from home with apps like ​Plex. I still have an HP 18 inch Windows laptop, but I have Windows installed on my Macs, as well. I recently updated all of them to Windows 10, though now that I have the Toshiba, I am mainly using it for my Windows needs. What software do you use and how do you use it? I would be lost at work without Excel. However, for home, I love Hazel, Alfred, Lightroom, and more. Here is an article on my favorite software and cloud services. When I updated my displays, I wanted a way to put the image up on my 4k Vizio and my 4k HP monitor. I was using an HDMI switch box, splitter, and a Denon receiver, but none of them worked with HDCP 2.2. That meant that Roku would not put out a 4k signal. The Onkyo was the least expensive option I could find that had 4k switching, HDCP 2.2, Airplay, and 8 HDMI inputs. 1. The Left/Right channels are NHT SB2s. I actually have a full 5.1 setup with NHT speakers, but that would be overkill for the space, so the center channel and 2 other NHT SB2s are still being used in the bedroom. They reach down to 51 Hz, so a subwoofer isn't necessarily required, but I added a sub just to access some of the lower notes. 2. The Center channel is a Polk TL1. I needed it to be as small as possible and this one fit the bill. If this was a living room setup, I would not go with this particular speaker, but it is ideal for my small bedroom to use with the occasional 5.1 audio signal. 3. Surrounds are Presidian Speakers - I bought these a long time ago from Radio Shack to use in the kitchen with a Super T-Amp, but ended up switching to a small Airplay speaker instead. They are fairly small, so that was the main reason I decided to use them as surrounds in the space. The Onkyo has a mic that you sit in one location and it takes measurements of the room. It assigned the frequencies that each speaker sends bass to the sub independently, so it helps make all of the different speaker designs work together. I tested the sound quality with the Beach Boys DVD-Audio disc of Pet Sounds and it sounded fantastic. Keep in mind that the setup is in a very small room, so that may have helped matters. However, I bet that my SACD/DVD-A multichannel discs will get spinned a lot more in the near future! I thought I would also add a section about my headphones in the room. I am a bit of a headphone hoarder, but they all sound different or have their own pluses and minuses, so I like and use each set I own for their own individual characteristics. Before discussing each headphone, I wanted to start with how I get audio from my computers to the headphones. I have a DACMagic DAC that has digital inputs and sends out audio via analog. Right now, I have a TC-754 amp in the mix because I wanted the ability to switch the analog outputs. It was getting an analog signal from my living room, which made it possible to record vinyl records on my computer, but I am not really using it for that these days, but I hesitate to remove it because I may want to use it for something down the road. The amp is feeding a Heed Canamp that feeds my AKG K701 headphones. The Heed also has analog outputs in the back and they are connected to the Onkyo receiver so I can listen to music on the speakers if I want. I have several pairs of headphones in the space. The AKGs get used most of the time, but I have the Steele Series Siberian Elites for when I want to listen to surround sound (I also like the bling factor of their LCDs), Parrot Zik 2.0s for Bluetooth mobility, ATH M50s which I often take on vacations when I don't want audio to escape, and Grado SR60s that I take on trips to the beach. I also have a few other pairs of headphones that I use in other parts of the house. Unfortunately, I thought I had kicked the bug, then I ended up ordering another pair of headphones from Massdrop. Any new non-audio stuff added to the space recently? I am always adding new stuff and pulling out old stuff. 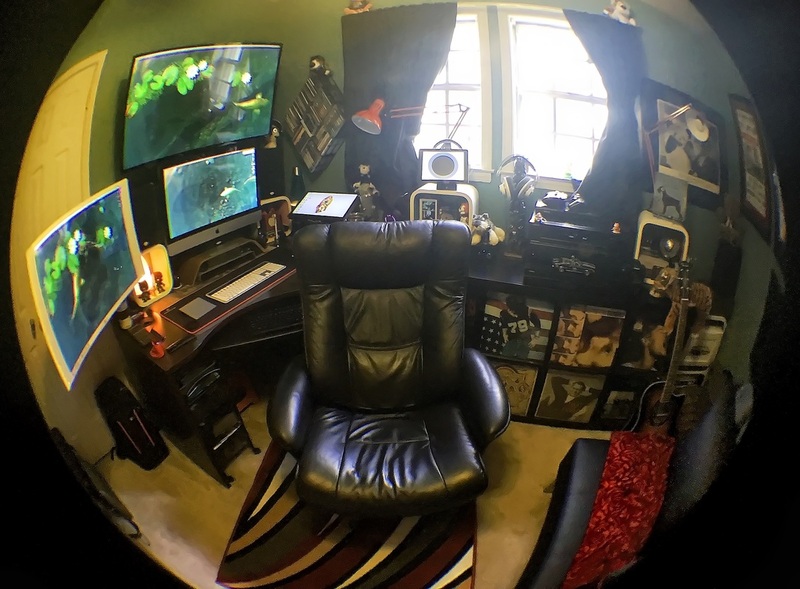 In the past 12 months or so, I have added a couple new headphone stands, a Lyve Hard Drive (also functions as a photo slideshow viewer), Hue Bulbs, a Hue Lightstrip that I have behind the TV, a stand for the Apple Pencil, a Yeti Rambler cup, and a 360 degree camera for when I want to shoot video of the entire room (I am sure a new video will be coming soon). I also added a couple new keyboards. I have a DasKeyboard. This is a mechanical keyboard that I mainly use in my lap and it feels amazing to type on (I have already partially written a review, so I will link it here when it is ready). I also bought a small Kanex keyboard that will move easily from my Mac Mini, to my iMac, to my iPad. It will mainly be used with the iPad, but sometimes I like using it if I know I will be jumping back and forth. I just updated to the iPhone 7 Plus in Jet Black and I have written my initial impressions here. What are your 5 favorite apps for the iPhone? 1. Apple Music was my 2015 app of the year. 2. Lastpass - I have never tried the other options out there, but this makes life so much easier. 3. Arlo - Gives me control of my home video cameras. 4. Downcast/Overcast - I am cheating by putting these together. If I had to live with just one, it would be Downcast because you can use it with paid subscriptions. Overcast doesn't work with subscription services, but I prefer it for everything else. 5. SimpleControl (Roomie Remote) - The best remote control app for the iPhone. Can control it all. 1. Astropad - Works like a small Cintiq tablet. In other words, it allows you to run Photoshop on a Mac and it will allow you to edit photos right on the iPad using the Apple Pencil. 2. Pixelmator - This is also a Pencil compatible photography app, but you can edit photos right on the iPad with it instead of using a Mac in the process. Right now, you still can't edit RAW files on the iPad, but this works nicely for jpegs. 3. Procreate - Amazing digital art app. It has layers available, so you can even trace a photo if you want. It has a ton of "brushes" and paint colors and everything is customizable. 4. Apple's Notes app - For writing notes and for simple sketches. 5. Pigment - Adult coloring book - Yes, I said adult coloring book! Don't look at me like that. It is actually kind of fun. I am using pretty much two cases with the iPad Pro. I am currently using the UAG Folio 9.7-inch iPad Pro for travel. It provides decent, lightweight protection and even has a place can slide in your Pencil. At home, I like something a bit lighter and I got the ultra-cheap MoKo Ultra Slim Lightweight (though, it doesn't appear to be available anymore). I have not purchased a keyboard case, but that is mainly because I don't consider the iPad a computer replacement. If I need to type a lot, I just pull out my laptop. Also, I have written many blog articles using the on screen keyboard laying on the couch and it works for me. I may add one at some point, especially if I get one to review, but it isn't a high priority at this point. I also have a 64GB iPad Air 2. It was an amazing upgrade from my iPad 3 and is still a great iPad if you don't need the Pencil, Smart Connector, or some of the other nifty upgrades. I also have an iPad 3 (Verizon 32GB) & iPhone 4S that still get some use. The iPad sits in my office, so I can run Alfred Remote or Roomie Remote app on it. The 4S sits on a Pure i20 Dock in my living room that feeds a Pa2v2 headphone amp. I use it less now that I figured out how to use a Dragonfly DAC with my iPhone 6 Plus and iPad Air2, but it still comes in handy on occasion. The 64GB 4S and Verizon 32GB iPad 3 are both in Lifeproof cases, so I use them around water (pool, hot tub, trips to the beach, etc.). I have a Lifeproof case for the Air 2, but it needs a cover before it becomes my main case. Even then, I like the Apple case because it is so light and thin, so I may just stick with the older devices when I need to be around water. 1. Texture- the best magazine app. Looks fantastic on the iPad. 2. Youtube - Love the larger display. 3. Evernote - I often write articles on the iPad and having an app that I can use them on any other device is fantastic (I use Pocket with Evernote, so I would include it, as well). 5. Lightroom - Another paid service that was once just for the computer, but now communicates with the iPad. 6. Flickr - my photo service of choice and it has only gotten better with automatic free uploads of photos I take with my iPhone. I hesitated to put the Apple Watch on this page, but it has been useful in my office because it makes a great remote control and I don't necessarily need to have my iPhone on me all the time. 1. Apple Music - I know that I mentioned this as my favorite iPhone app, but it is my favorite app on just about every (non-OSX) device that it resides on. On the Watch, it gives you complete control with Siri, you can change Airplay devices right from the watch, and control volume. 2. SimpleControl - Being able to control my entire entertainment center from a watch is mind blowing. 3. (new entry) iDevice app - This controls lights around the house with Siri. It also has a cool iGrill2 app and I can monitor my grill's temperature from the app (in addition to doubling the Bluetooth range). 4. Remote app - This is the app that control the AppleTV or iTunes music controls. It comes in handy because my AppleTV4 is also in the living room, but I can use it in my office thanks to the dual HDMI outputs on my living room receiver. 5. Fantastical 2 - Keep track of my Fantastical calendar without needing to pay the 49.99 that is required for the Mac app. 6. Carrot Weather - When I am in my office for a while, it is inevitable that the dogs will need to go out. It is nice to be able to look down at my watch and know what it feels like before we head out. There are other cool things like the reminder to stand up, which I appreciate when I am editing photos and forget about time. It also has a Directv app, an Anova app (for Sous Vide cooking), a WeMo app, Deliveries app, I get notifications when motion is captured on my video cameras, etc. I only own one Android device called an Asus Memo Pad 7. I mainly use it with DSLRController which I plan to review soon. I also like the way the weather and Google Calendar are always up on the screen. What’s the furniture in your workspace? Bush Series C Right L-Bow Desk - It took a long time to find a desk that fit perfectly into the space. I have a closet door in the way, so this was the absolute largest desk I could fit in the spot. One of the reasons I chose it over some of their other models is that I liked the dark color and the fact that it was not open on the bottom. It has backing board, so it hides some of the cables (that I have managed to some extent) that comes with having tons of electronics. The white cubes on the desk came from Azar Displays - I get more questions about them than anything else in the room. iKea Expedit - Simply put, I love this stand/bookcase. It does everything I need and does it cheaper than a lot of the alternatives. "Innovation Deluxe Cube Chair" (I bought it from Scan Interiors, so I can't vouch for this seller that has it right now) - this is small, sleek, and will fold out into a bed. It is perfect for a small room. Also, the fact that it is armless is great for learning the guitar. My pups like to lay on it while I am working. MStand Rain Design, Inc - this is the stand I use for a MBP. It looks great and feels sturdy even though I have it on a shelf that I have on the desk. Mesh rolling stand with drawers (under desk) - The desk does not have drawers, so I bought this for storage. I got mesh so I could see into the drawers and rollers to make it easy to get to. Hatch Show Prints - Got these in Nashville and had them framed. I also have an "Elvis with Panda" photo on the wall signed by Alfred Wertheimer. IMG Windsor reclining office chair (it looks like they changed the name to Salsa Soho)- This may be the most indispensable thing in the office. It is the perfect chair for lounging, working, and listening to music. It reclines like a lazy boy, so I can easily watch the large mounted LCD on the wall, it is large sized, etc.. I have a Herman Miller Aeron chair at work, which is nice for work tasks. However, I much prefer this chair for home use. Grovemade stand - This is the wood stand I have my iMac sitting on. I have a Macessity slim stand under it, so I can house a Wacom tablet and extra keyboard under it. Black out curtains (the exact model I own is no longer available, but this is similar)- While these aren't the most stylish curtains, they accomplish the goal of turning off the sun and eliminating glare in the room. Greenco Super Strong Foldable Stool - I can put my feet up on this when I am using the monitor hanging off the side of my desk or I can stick it under my desk when I am watching TV or using the iMac. I placed a small pillow on top, so it is comfy! Classic Flame Serendipity Infrared Wall Hanging Fireplace - Got this to hang on the back wall for ambience. The early 2016 video has a demonstration of some of its settings. Any Blog Posts Related to the Office? Many more articles can be found on my blog page, just use the search feature. What accessories and electronics are in the room? Logitech Solar Keyboard - I have several Mac keyboards, but they often need batteries and the lack of a ten key is a major problem for me. As a result, I solved that issue with the Logitech Solar Keyboard K750. I have also added a DASKeyboard to the setup. I mainly use the DAS, but the Solar Keyboard is nice for when I want to sit in the chair in the back of the room and watch a movie or something on the top monitor. Mice - I have three mice on the desk. The magic trackpad, the magic mouse, and a Logitech Performance MX. I love having the variety, but I mainly use the Logitech. Mouse Pads - Since I have so many mice, I have two separate mouse pads. I had high hopes for the Glorious Extended White Gaming Mouse Mat, but it wasn't actually white, so I was on the verge of sending it back. I am still not happy it isn't white, but I find it to be useful in my setup. I also have a Grovemade mouse pad. Cambridge DACMagic - This is a digital to analog audio converter. I have an iMac hooked up via USB, the Gateway PC via coax, and the Mini is hooked up via optical. In addition to sending out an analog signal, it also passes through digital when I want to send the signal to a 5.1 speaker setup. I chose it over other DACs based on its flexibility, great reviews, and price. Heed CanAmp - This is a headphone amp that are used with a pair of AKG K701 headphones. The combination is spectacular. The Heed also has RCA pass though, so it feeds a receiver. The folks on Head Fi suggested this amp for use with the K701s, so who was I to argue? Onkyo TX-NR646 (see audio section above for more). It is also fed an HDMI signal from the Denon 4311CI receiver in the living room, so it provides a ton of entertainment options. The iPad can control the Denon 4311CI with its web interface. Yamaha DVD-C750 Universal player. I mainly listen to CDs that are ripped in lossless formats to the mini, but I also have SACDs/DVDAs/DualDiscs that I like to listen to in the office. The Yamaha plays nearly everything (no blu-ray) and will accept 5 discs at a time, so I am not constantly changing out discs while working in the office. Airport Extreme/Comcast cable modem/Linksys routers/external hard drives/etc - these are all part of my home network. Logitech Z680 THX speaker system- I got this a long, long time ago with a Dell PC (that died). I still use this for 5.1 sources. It has digital inputs for optical, coax, and 5.1 inputs. This gives it a lot of flexibility. I am not a fan of the setup for music, but for movies and games it is hard to beat when you consider the size of the room. Nintendo NES - Still love Festers Quest, Tetris, Mario Bros, etc. Atari Ten in 1 - I love Asteroids! Amazon Kindle - I got this when I found out I had jury duty. I did not want to carry my iPad around all day and I wanted one for reading in the sun anyway. I have an AppleTV (2) unit in the room for listening to iTunes, Airplay, and other apps. With the 4311 feed from my living room, I also have access to Directv, Roku, AppleTV3, Oppo, Blueray, etc. NHT SB2 bookshelf speakers (see more in the audio section above) - Fantastic speakers that were part of my home theater at one time. Synology 413j NAS - Works as my main backup location for my computers, music collection, photos and movies. I also use the DS Audio app quite a bit. It allows the user to send separate Airplay streams to separate devices at the same time (you can't do this from iTunes). Headphones in the room - Parrot Zik 2.0 (bluetooth), Ety Er4P ear monitors, AKG K701s, ATH M50s, SteelSeries Siberia Elites, and Grado SR60s. I mainly use the AKGs. I use Hue lights in the red lamps and LEDs behind the desk. Anything Else in the Room? I have a Spirit treadmill that tucks into the closet and my dad made a custom bookshelf to fit into the space on the other side of the room. I need to take pics of that space, but it is mainly used for books, CDs, DVDs, and my printer is tucked away behind one of the doors. Right now, the space works just how I want it to. 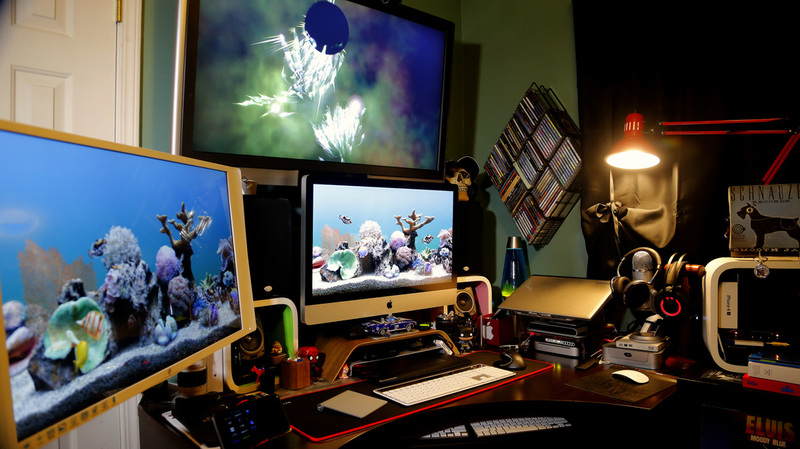 I have thought about replacing the iMac with either another display or a 5k iMac, but I would lose some functionality since I often just keep the MBP in the living room and use the iMac's computer when I am in the space. Replacing it with 4k or 5k display would require me to get the MBP every time I want to use the space. The iMac 5k would be the best solution, IF it allowed Target Display mode so that I could share its display with my MBP. However, the iMac 5K doesn't work with Target Display like my 2011 iMac. It is a bummer, but I would have to give up something to get the extra resolution. At this point, I would rather live with the 2560x1440 which isn't a huge step down from 4k anyway. I would have even considered the Microsoft Surface Studio if it worked as a display for the MBP, but it is also crippled in that area. I can't think of anything else I want in the space at this point. I am sure something will come out in the future that I will want, but right now I am happy with the room. Please email me by using the link at the top of the page if you have any comments, questions, or criticisms. The amount of SPAM I have been receiving on my Comment Forms has been increasing on a daily basis, so I have removed them. I may add them back later when hopefully the Spammers get the idea that the Forms are no longer around. Here are a few of the past comments (I am only including the first names to protect the innocent) I have received. When people ask me why I bother with the site, it is because sharing ideas on the internet is one of the best uses of it (in my opinion). I visit forums, blogs and other sites to read ideas/opinions and now I am sharing my ideas with you. Also, comments like those below show me that the time I have taken has inspired and helped others (notice that Mike also took the time to share his experience with me). If you sent a comment and it is not below, keep in mind that I only selected some of the comments, but I am still very happy that you took the time to comment. own home office remodel. Where did you get that cube chair from? answer: It is an "Innovation Cubed Chair" - I got mine from ScanInteriors in Memphis. the feeling what you've made in my own. Keep up the good work! of one another, just next to your iPad? answer: The Sony Receiver and Yamaha universal player mentioned in the equipment section above. 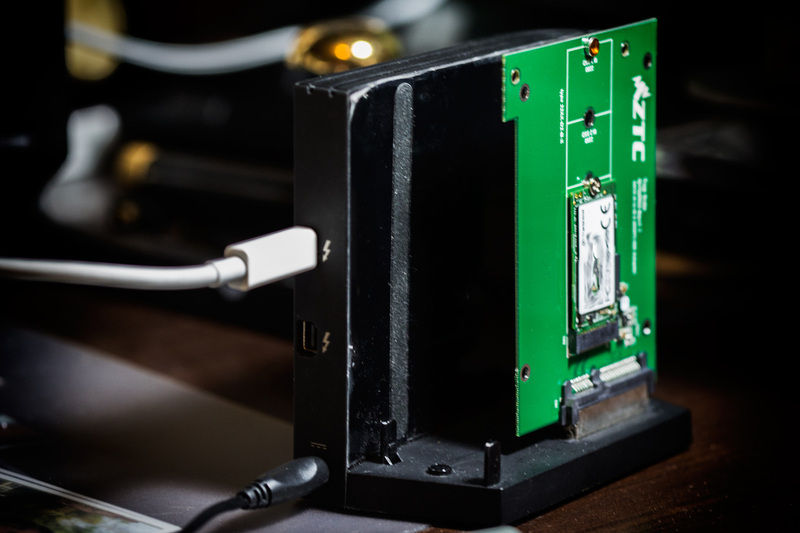 relatively inexpensive and easy-to-use NAS you may want to consider a DroboFS. looking for an elegant solution for mine and yours looks like it could work. answer: I am using a Joby Ori case for the iPad original that folds into a stand. I reviewed it on Amazon. a great idea how to haha. as a guest bed. Thanks! I love it ! Thanks for share it ! Good choice with green color. Thanks again for all the comments, it lets me know that my time has not been wasted.